This entry was posted on Tuesday, January 29th, 2019 at 12:46 pm. CAMPAIGNERS are left questioning democracy after Wiltshire Council voted to grant planning permission for the revised plans of an Advanced Thermal Treatment plant in Westbury – despite vociferous objections from local town and parish councils, the local MP and local people. 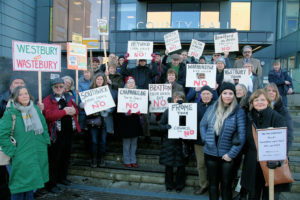 Over 50 campaigners attended the strategic planning committee meeting at County Hall on Wednesday 23rd January to hear seven committee members vote in favour of the plans, to four against. The decision flies in the face of opposition from Westbury Town Council, other local parish councils and hundreds of campaigners. Following the decision, MP for Westbury, Andrew Murrison, has written to the Secretary of State, James Brokenshire MP, asking him to call-in the decision, stating it would be ‘unacceptably close to several thousand homes in and around Westbury’. If the Secretary of State agrees, the decision could then go to a public inquiry for further discussion. Last July, Wiltshire Council refused planning for the waste treatment plant by Northacre Renewable Energy on the grounds of size, scale and bulk. But Wiltshire councillors agreed to grant planning permission for the revised application after the company decreased the size of the building, with the council claiming it is now ‘almost invisible’ in the Westbury skyline. Following the decision, campaigner David Davis wrote to the White Horse News to question the process of democracy saying, “The county chamber was full and even though there was objections by our MP, Westbury Town Council, Frome Town Council and the local parish councils plus hundreds of the public, it all fell on these councillors’ deaf ears. Mayor of Westbury, cllr Ian Cunningham said, “Obviously we are very disappointed. It’s the wrong location for such a facility. We will now respond to any public health and views from the Environmental Agency, but we are aware of the fact that the law under which the Environmental Agency works lags at least 10 years behind any scientific research. So they wont be looking at the kind of pollution that we believe is a concern because there is little knowledge. Deputy mayor, cllr Mike Sutton said, “Very disappointed that the people elected to represent the people of Westbury don’t take any interest. It’s disappointing that Hills, even though we recognise they are a commercial firm, move ahead against the wishes of the people they profess to serve and live with. Fellow WGAG member, Margaret Cavanna said, “I am disgusted that certain councillors on the committee are not challenging the company’s plans. It was clear that the planning case officer and chair were guiding the committee to the result that they wanted. “It’s just frustrating that it was so unequal. The WGAG were only allowed one speaker for three minutes. We also wrote to the committee with our evidence against, but we were told that they don’t really read it. I didn’t even get an acknowledgement. “But it’s not over yet, the group will still have their input if the plans go before the Secretary of State where we will fight for a public enquiry but we can also scrutinise the details of the company’s operating permit with the Environmental Agency. A spokesperson for Northacre Renewable Energy said, “The facility will provide a long term sustainable solution for non-recyclable waste in Wiltshire. It will generate 25.5MW of renewable energy, enough to power up to 46,000 homes. It will recover energy from materials that would otherwise be landfilled or transported hundreds of miles by road to be processed. Over 150 jobs will be created during construction and 40 permanent jobs once the plant is in operation, ensuring that waste is used to generate environmental and economic benefits. Dreadful lack of care by the WCC makes you wonder who gains from this very undemocratic decision….certainly not west Wilts and Westbury in particular. Is he unaware of the growing demand by ordinary people that businesses,factorys,supermarkets,etc,and the populating as a whole must produce less non-recyclable waste and food waste. We are all becoming aware that our planet’s future depends on us all making huge lifestyle changes. Already we see changes in packaging single use plastics,recycling etc and pressure being put on government to inforce such changes. Wiltshire and certainly during the life of this ATT incinerator. As for saving waste from being transported hundreds of miles to landfill how do they propose the huge amounts of waste this incinerator will need is to reach Westbury, by road of course,through our already overcrowed roads!